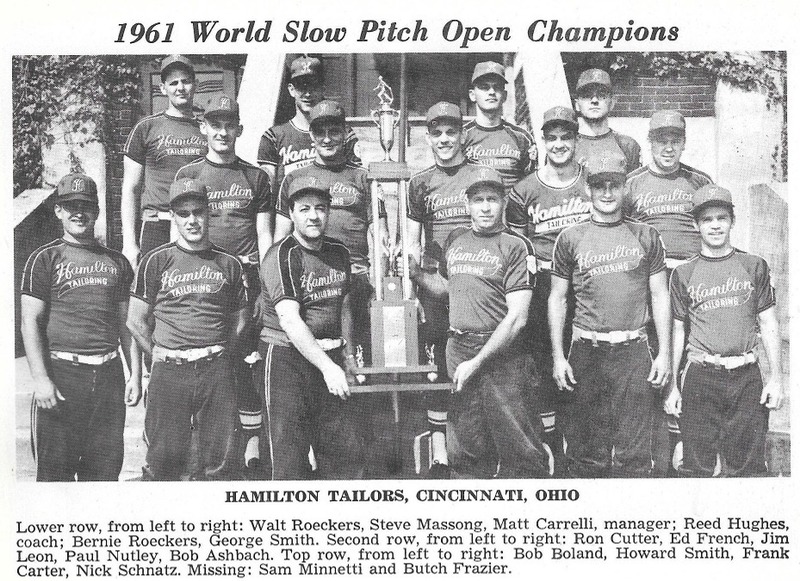 1961 held at Cincinnati, Ohio. Dairy Cottage got 5 runs in 7th inning highlighted by Kathy Walz’s 3rd hit of the game leading the 11-hit attack that gave Dairy Cottage pitcher Sandy Conway the 9-6 victory over the Cleveland Jets in the Women’s first official Slow Pitch National Championship. Conway was 3-0 pitching for the champs. Her teammates had her back scoring 30 runs in the 3 games Dairy Cottage won, Conway surrendered eleven runs. The 7th inning uprising was highlighted by Cindy Windburn and Joyce Mason, both delivered 2-run singles breaking a 4-4 tie in the top of the 7th, making the score 9-4. Cleveland tallied 2 runs in the bottom of the 7th, but it wasn’t enough. Cleveland’s Ruth Poole was the losing pitcher. — Cathy Walz and Sandy Conway both hit home runs for Dairy Cottage. Hamilton Tailors eliminated Gatliffs 11-1 behind Sam Minitti’s Pitching. Then the Tailors had to win both games in the finals to repeat as ASA Open National Champions. Sam Minnitti pitched a 5-2 victory in the first game and also hit a 3-run homerun to win the game in the 7th inning. Then he came back and pitched 3-hit shutout against the powerful New York City team to clinch the championship 2-0. Minnitti gave up only 7 total hits in both games. He also went 7-1 overall as a pitcher and in 8 games, only gave up 22 runs, including a shutout and three 1-run games. Somehow he was not named the MVP. Jim Harper of 4th place Ready-Mix from Knoxville was named MVP. Minnitti was named most valuable Pitcher. 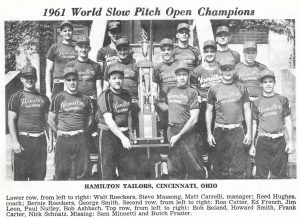 Counting the 1960 Nationals where he was 9-1, Minniti had a 16-2 pitching record in the back to back titles. Becoming only the second team to perform this feat. Gatliffs of Kentucky won two straight in 1956 and 57. Plateau AC won its first 5 games, defeating The Tailors along the way 9-8 to send them to the losers bracket. 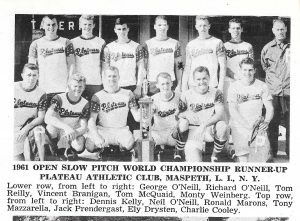 Plateau’s stars were Bob Beier and George O’Neill, who both started off the tournament with 8 straight hits and Morty Weinberg, who excelled in Short Field and hit 2 HRs also.